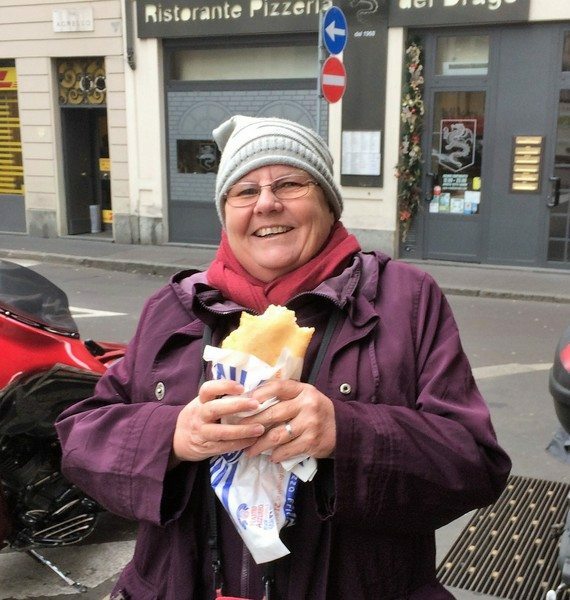 It was freezing this morning as we left the apartment headed for the tram to take us into Milan’s Duomo square. 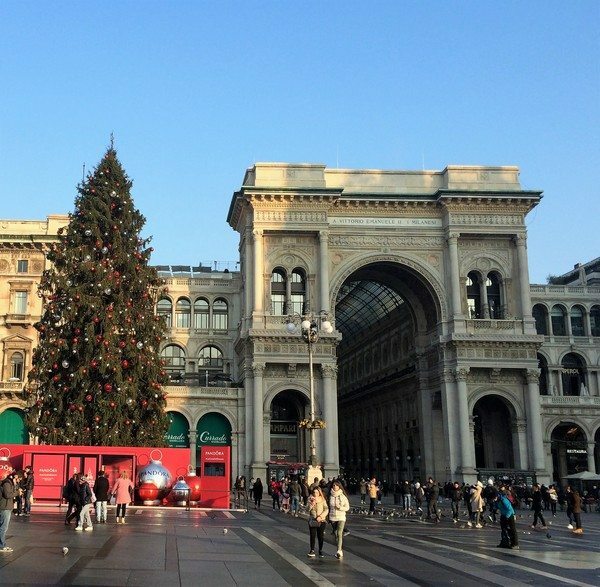 Today we’re taking a walking tour of Milan. We were glad we decided to leave the bike at the apartment as we discovered it covered in ice.The tram surprisingly, was not very full. Maybe it was too early on a Saturday for most locals. Arriving at Duomo we headed for the Cathedral where we met up with Marco from Walkabout Tours. After rounding up a rather large group and introductions we were on our way. 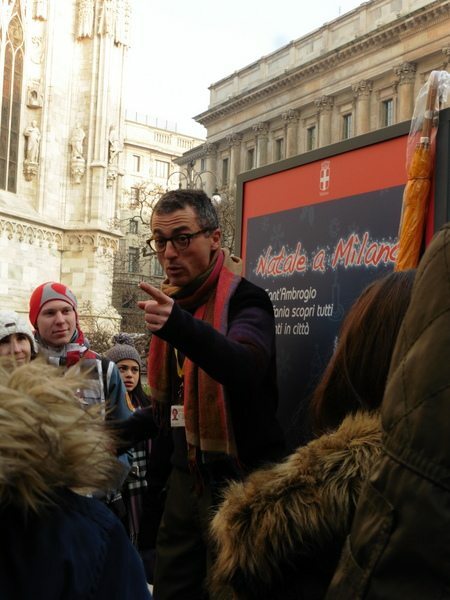 We soon discovered that Marco was a great guide who loved showing people his beloved city of Milan. He was really quite animated and as soon as he would start talking his arms would be flailing all over the place. It was quite fascinating when he explained how Milan gained its coat of arms. 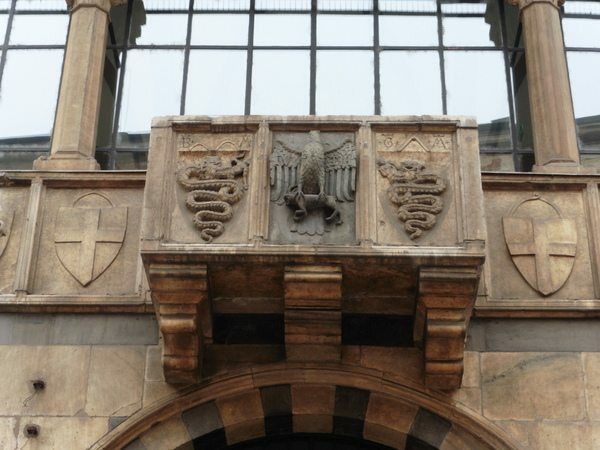 The crusader shield of white with a red St George’s cross was the original city’s crest until the Visconti Family gained control of Milan in the 13th century. Otone Visconti was made Archbishop of Milan by Pope Urban IV beating Raimondo Della Torre, Biship of Como. It sparked a family war between the Viscontis and the Della Torre’s. Eventually Otone defeated his rival which included slaying him at the Battle of Desio. 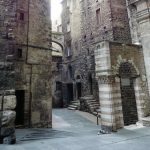 The Visconti ruled the city until the 1500’s. The Visconti coat of arms was a serpent swallowing a Saracen. Supposedly the family gained the coat of arms after a successfully defeating a Saracen knight. The city of Milan was to adopt the biscione (serpent swallowing the man) alongside its crusader shield. These days the crest appears of various logos associated with Milan such as Alpha Romeo, Inter Milan FC. 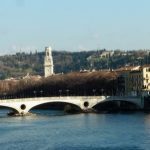 During the Visconti rule of the city Gian Galeazzo Visconti was made Duke of Milan by King Wenceslaus, King of the Romans. 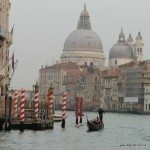 With the Visconti family gaining status he and his cousin Archbishop Antonio embarked on a plan to build a grand Gothic Cathedral. 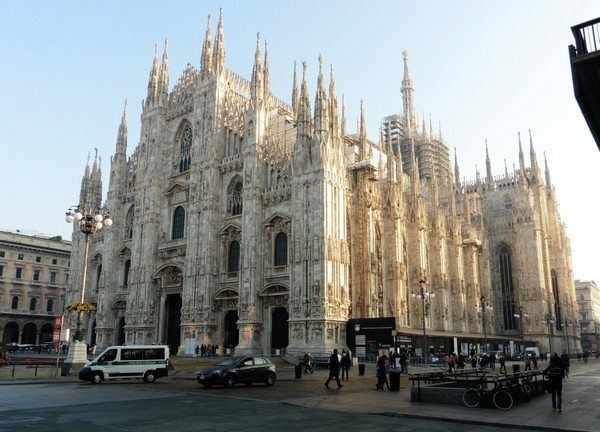 Money was raised by the citizens of Milan and the Cathedral was built in brick covered in marble paneling. The marble was quarried from the Visconti quarries. By the time Gian Galeazzo Visconti died the cathedral was half finished but little did he know it would take 600 years to build. In fact the Duomo although started in 1386 but not finished until 1965. Around the sides and back of the Duomo the square is filled with Christmas markets. 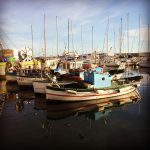 There’s stalls selling T-shirts, gifts, Christmas decorations, salamis, cheese, hams, sweets and jewellery. The smells are just amazing with all the Christmas foods being prepared. Walking through Milan Marco pointed out lots of interesting buildings and told us some of the history of the city. Whenever he started talking his whole body would come alive and his eyes would sparkle with excitement. He told us of the rise of Rome, the separation and the 476 fall of Rome. We also leant about the Visconti’s and the modern history of Milan. 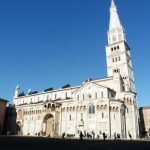 At Basilica dei Santi Apostoli e Nazzaro Maggiore we made a stop to admire the different types of architecture. 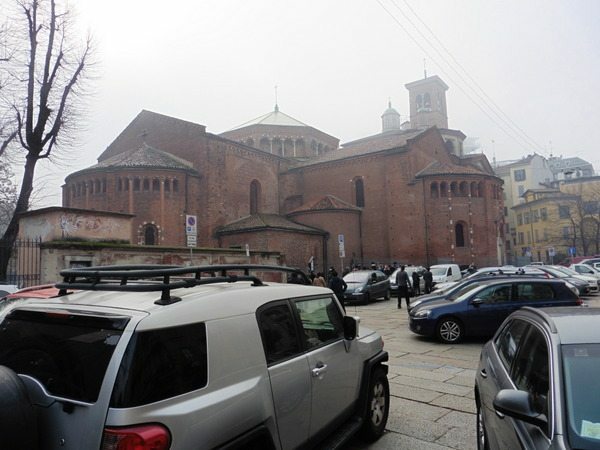 It is the earliest church in Milan with early christian, romanesque and renaissance architecture. Construction was started in 382 by Bishop Ambrose and it was built in a Greek cross shape, quite common throughout the Mediterranean region. It was built on the roman road which leads south out of the city. Beneath the current street the roman road still exists. Over the years there were additions to church including an apse to house the bodies of St Nazarius and Sr Celsus. 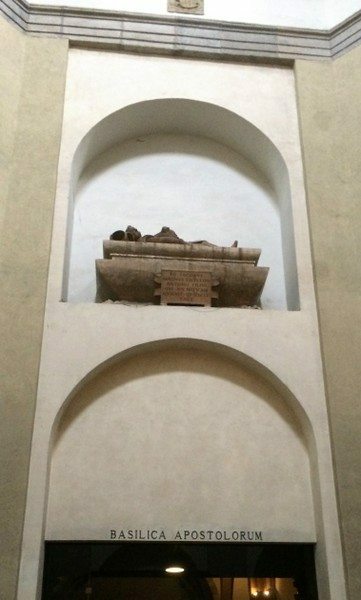 Their decapitated bodies were discovered in Bishop Ambrose’s garden. Supposedly they were martyred in Milan for preaching christianity. Entry to Basilica dei Santi Apostoli e Nazzaro Maggiore is through Cappella Trivulzio the renaissance chapel built by Gian Giacomo Trivulzio to house his tomb. He was a much loathed governor of Milan known for his arrogance. Even the epitaph below his tomb basically tells everyone to kiss his arse. On the facade of Cappella Trivulzio are the family crests including the crest of his first wife Margherita Colleoni. Looking closely at the crest we noticed it looked like three testicles. Sure enough the family coat of arms was designed by Bartolomeo Colleoni who was the very proud owner of three testicles. It said a lot about the family in a time when having “colleoni’s” or in spanish “cajones” meant something. Wandering around Milan we visited Ospitale Maggiore a beautiful Renaissance and gothic styled building. Th two storey building has four wings surrounding a quadrangle with an internal balcony. 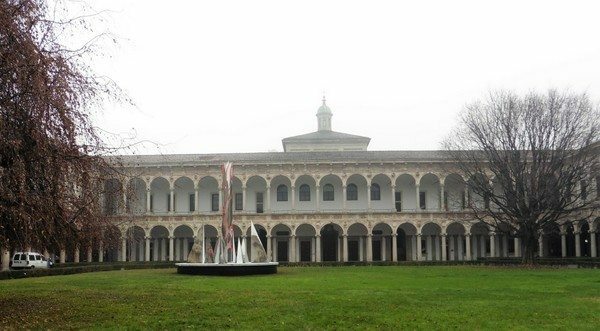 Ospitale Maggiore was built by Francesco Sforza in 1456 as a community hospital. It was one of the first of its kind with a primary purpose of caring for the sick no matter how rich they were. People even were said to feign sickness so that they could be fed, washed and sleep in a bed. After the Second World War the building became part of the university. The students have a superstition about walking on the grass. If you walk on it before you graduate you will not graduate…or is it a clever way to keep them off the grass. Heading back towards the Cathedral we headed through Galleria Vittorio Emanuele II. The four storey glass topped shopping arcade was built in the late 1800’s. It features a triumphal style arched entry and an arched roof of steel and glass. In the centre of the galleria is an intersection where the four arms of the arcade meet beneath the domed hexagonal glass roof. As it’s Christmas a massive tree is set up with lights and tinsel. 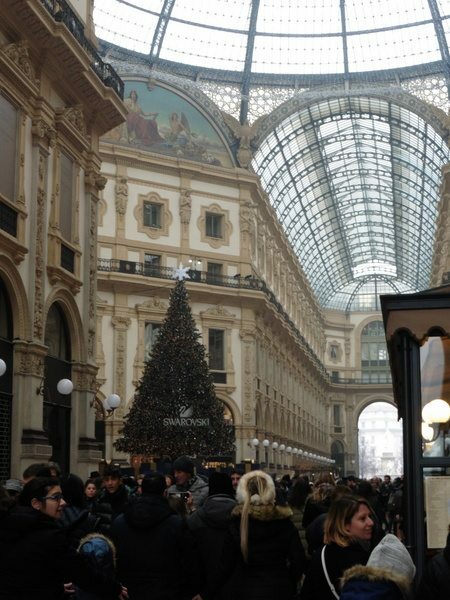 Galleria Vittorio Emanuele II is one of the worlds oldest shopping arcades. 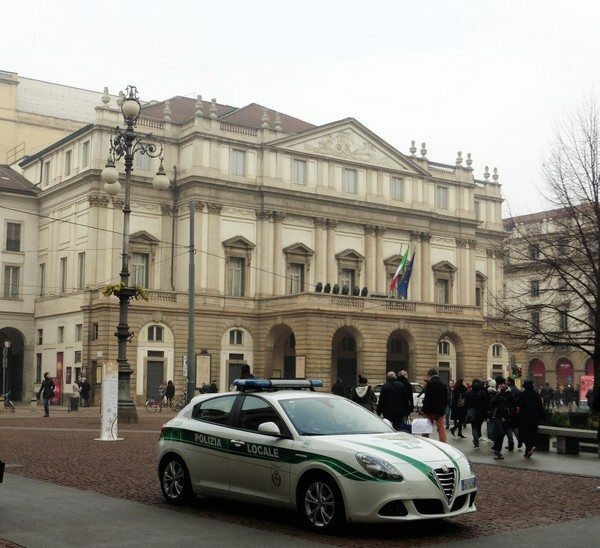 Marco told us an interesting tale of Milan’s Opera house, Teatro alla Scala. The story goes that the old theatre burnt down in 1776. Ninety prominent families wrote to Archduke Franz Ferdinand of Austria-Este to replace the Opera House. The first plan was rejected however a second plan was put forward which was accepted by Empress Maria Theresa. The site chosen was where the Church of Santa Maria Alla Scala stood. It was demolished adn the Opera House named in its honour. The new Opera house operated as a casino with gaming in the foyer. It also featured private boxes just like the previous opera house. The private boxes were used for many different uses, mostly nothing to do with Opera. Gambling was allowed but only during the Opera, so in the private boxes the money flowed. Eventually gambling was outlawed but not until 34 years after the Opera House opened. As the private boxes were all privately owned they were all decorated differently, with each owner trying to outdo all the others. The boxes were also used for meetings, trading, cooking, and of course secret affairs behind the safety of the curtains. It must’ve been impossible for the opera stars of the time to perform in the theatre with punters celebrating their wins, cooking smoke filling the auditorium, and the moaning drifting down from the closed curtains. Not far from Piazza Duomo is the old market square. At one time all the roads from the city gates led to this one square. The former market square is overlooked by the medieval town hall. Built of black and white marble the former town hall is still a majestic building. During the middle ages merchants would set their tables up in the markets to sell their goods. If the merchants fell into debt and couldn’t pay their bills they were publicly shamed. All of their possessions were auctioned in the marketplace and their desk broken. Marco was proud to tell us that Italy gave us the origin of the word bankrupt. 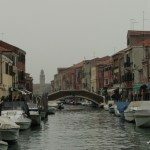 It originated from joining the two Italian words Banco =bank and Rotto=break. So Bancorotto the breaking of a merchants desk and his possessions becomes bankrupt. From the square we headed towards Milan’s home of the Italian stock exchange. Mauritzio Catalan’s famous finger sculpture stands in Piazza Affari which is also home to the Italian Stock Exchange. The scuplture which features a hand with just the middle finger which is extended is entitled L.O.V.E., which stands for Libertà, Odio, Vendetta, Eternità (Freedom, Hate, Vengeance, Eternity). 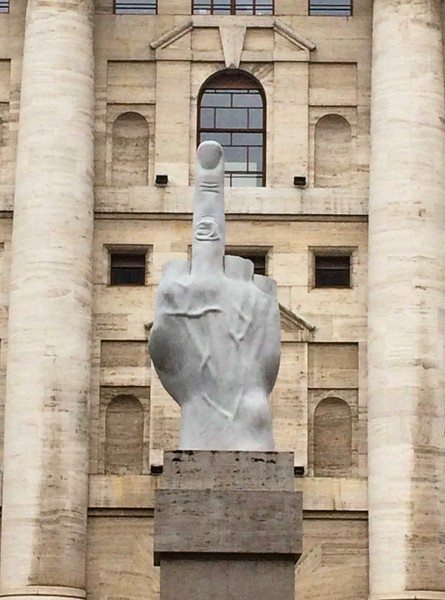 Speculation about the sculpture has it that it’s an “Up Yours!” message to the stock exchange after Italy’s economic woes. However Mauritzio has never explained his sculpture. On the tour we met up with two Indian girls on holiday in Milan, so once the tour finished we headed of for coffee together. It was interesting learning a little about their life in Germany where they are currently working and India. 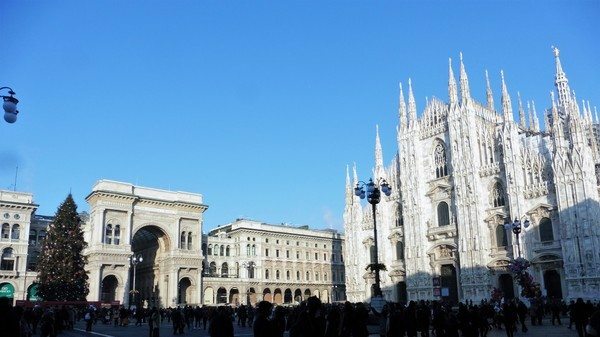 On our second day in Milan we returned to the Duomo where we purchased and entry ticket. The main ticket booth is situated in front left of the Duomo and long lines stretch out from it. However, there is actually another ticket office behind the Duomo with no lines. We of course used this one. Tickets vary in cost form 2 euros to visit the Cathedral itself rising if you want to go up to the top by elevator to see the views. 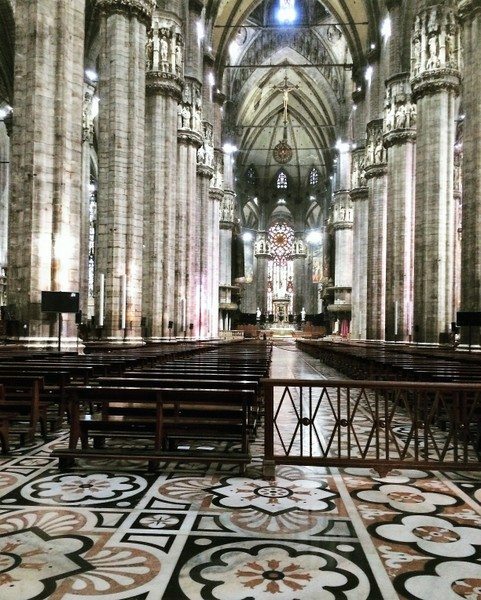 The interior of the duomo is quite beautiful with high vaulted ceilings, a long central nave and two side naves leading to the transept. The marble flooring is exquisite, featuring a floral pattern of black, white, and brown marble. High screens are mounted around the central area to stop photography during church services (why they were even open when they had Mass on was beyond us). However, it doesn’t even deter the hardened tourists who flow brought the Duomo. It must be a difficult balancing act between making money and religious practice. However, we think that the balance is tipped towards money making. 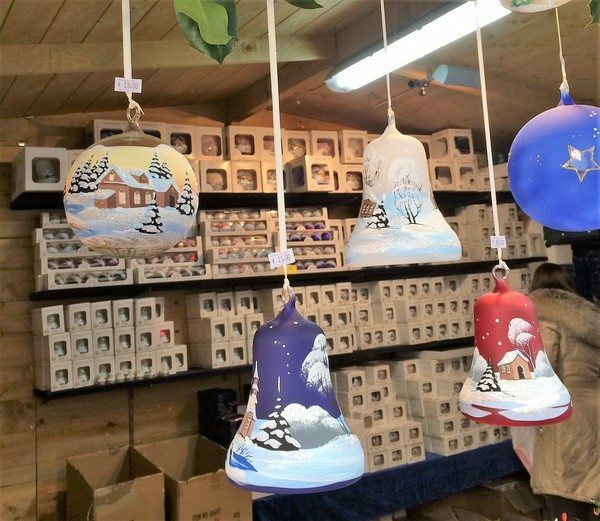 Once again we wandered through the advent markets taking inthe sights and sounds. The giant pretzels with Parma ham, mustard and bitey Parmesan cheese was a real treat. However, the roasted chestnuts seller got a wide berth. Of course we wandered through Galleria Vittorio Emanuele II again. Despite the crowds it really is beautiful just walking through it. 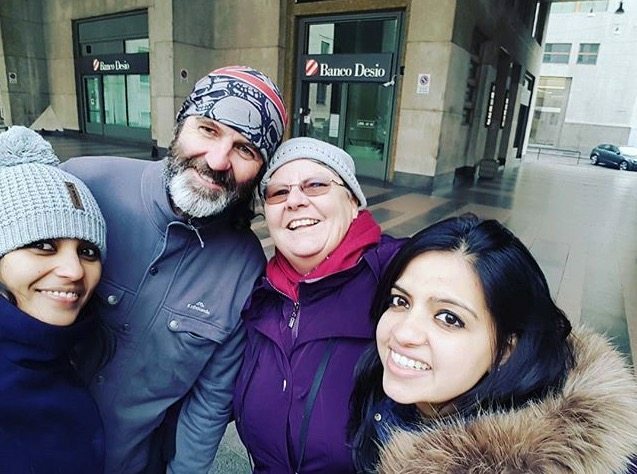 We’ve really enjoyed visiting Milan although the low temperatures and fog haven’t been fun. Tomorrow we head to Verona where we’ll be storing the bike whilst we spend Christmas and new year in Attersee in Austria. Like the sound of that pretzel.